Outfitting a mobile office van requires some finesse, but is not as difficult as it may seem. There are many mobile office equipment available for sprinter vans and trucks, fitting nearly any need. With so many businesses moving to electronic record systems and invoicing, the inclusion of a laptop and power source are integral mobile office necessity. The mobile office sprinter van may include a van desk, van center console or computer stand in order to accommodate these needs. For many smaller businesses, it is more cost effective to have a mobile office van than it is to set up a brick and mortar stand-alone office. Computer stands for vehicles and van desks make this a much more realistic option. Lighting is another concern, but special interior van lighting is available and can illuminate the work area without creating a significant draw on the vehicle’s primary power source. Many vehicles that are used as mobile offices use power adapters for vans to run their various electronic devices. Special interior truck lighting can be arranged to adequately illuminate the workspace, solving the lighting concerns. 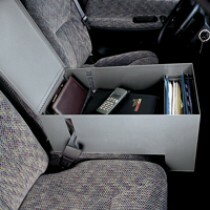 A mobile office truck or van may contain one or more laptop computers, van center console, an adding machine or even a cash register, a printer, a scanner, and portable copier. Any equipment that may be found in a regular office can be used in a mobile office – just usually on a smaller scale. The only restrictions are space, but most mobile office equipment is available in smaller, and portable sizes.